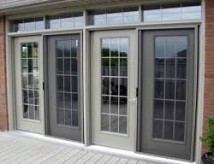 Garden Doors are a Great Alternative to patio Doors for both looks, and the need for a larger opening. With Both Doors being Able to Open it Allows for Ease of Access. Full Screens are available to accomodate. Garden Doors available in steel, wood, or fiberglass. Widths of 2, 3, and 4 panels. Glass options are almost limitless as we offer clear and decorative glass from many manufacturers.